Frocks On Bikes delights in Wellington’s undisputed status as the Cafe Capital of Aotearoa. Our bikes bring even the furthest-flung cafes within easy reach, and open up the city to us! Armed with our bike-locks, high caffeine tolerance and discerning appetites, we regularly sally forth en flock to enjoy the fantastic establishments found right throughout the city. We do Lunchtime Promenades to fit within the respectable working lunchtime: pop across town to a great cafe, enjoy lunch, nip back to work – easy as pie! In summer these include spontaneous swim-and/-or- icecream beach jaunts to Oriental Bay. All it takes is keeping a spare pair of togs and a towel at work, and you can be the envy of your colleagues: sea-refreshed and sun-kissed all afternoon! We do Brunch Rides – a relaxed start on Saturday or Sunday, cruise out to one of the excellent suburban eating houses, and enjoy leisurely and super-social brunches in style. Meet great people from all over the city and enjoy the match made in heaven: a fun and social ride plus excellent food and coffee. We do Frocknics – organised rides to places of beauty where we enjoy great food and company al fresco in gorgeous surroundings. As close as our own Botanic Gardens… as far as the beautiful Wairarapa! A flock of 23 Frockers and hangers-on enjoyed an awesome bike ride in the Wairarapa, on Sunday 6 December. The following roundup is thanks to the fantastic Patrick from CAN, who organised the Frock-nic for Frocks On Bikes. Frocks is giving the glad-eye to superb Wellington initiative Conscious Consumers. We’re a pretty discerning bunch – we like our coffee fair trade and our eggs from happy chooks – and we love to eat and drink and socialise. It looks like a perfect partnership to us! Frockers are cooking up plans for dinner rides – an excellent initiative from out in the Flock that we’re jumping on. We can’t give away too much, but think exciting ethnic cuisine plus live music… and watch this space! 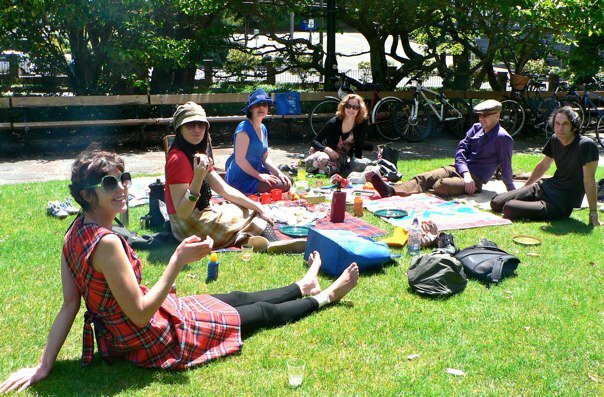 Keen to join Frocks for a leisurely brunch (or dinner, or breakfast) ride? Or to lead one to your favourite establishment? Let us know!